Chickpeas Pulao also known as Chana Pulao and Kabuli Chana Chawal. This is a simple rice dish and very famous in Pakistan. Many people use boiled chickepeas in it, but I fried onion first then add chickpeas to cook. If you want to add boiled chickpeas then you can in step 4 but don’t add water in step 3. 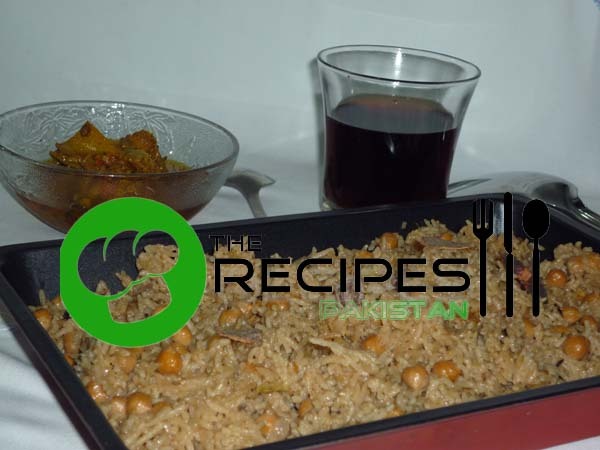 Chickpeas are loaded with fiber and protein so Chickpeas Pulao is a healthy dish. In my family everyone love to eat it. It goes great with mint raita. Fry onion and whole hot spice in oil to golden grown. Stir fry ginger garlic paste, tomatoes and green chili. Add salt, red chili powder; add 3 glass water and bring to boil. Add chickpeas to cook until soft and water evaporates. Then add yogurt, stir to dries up yogurt water. Now add 1-1/2 cups water, allow boiling and add rice. When three quarter done and water dry simmer about 10 minutes. Ready to serve with raita or mint chutney.